A detailed wall hanging will add interest to any space. 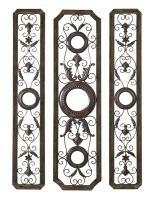 One of our favorites is the Large Mediterranean Metal and Mirror Wall Grille Set. This Mediterranean style wall grille is exquisite! Its grand size and detailed craftsmanship needs to be viewed in person to truly appreciate it. Crafted from metal, it has 3 panels that can be hung to fit your space. The set of 3 panels features 5 small round mirrors and an open work design which will allow your wall color to show through, becoming part of the design. It is a great idea to fill a large wall. For more details visit http://www.cheapchicdecor.com/Wall-Decor/Wall-Mirrors/Large-Mediterranean-Metal-and-Mirror-Wall-Grille-Set-of-3-p653.html.